Caltex, marketed by Chevron Philippines Inc. (CPI), has recently announced the grand winner of P 1,000,000 to be credited to his Visa card from the Caltex-Visa payWave Drive Away a Millionaire promo: Dominic Tan of Davao City. Tan, a regular user of Visa and other Caltex rewards partners such as Robinsons Rewards Cards and HappyPlus, has been going for fuel ups to the same Caltex station in Bajada, Davao City for the past seven years. “I actually did not believe when I first got the news. I immediately called my wife and she also could not believe that I won a million pesos. We’re very happy right now with this huge gift from Caltex and Visa, and we will surely have a lot of time together with our kids enjoying this prize,” Tan shared. 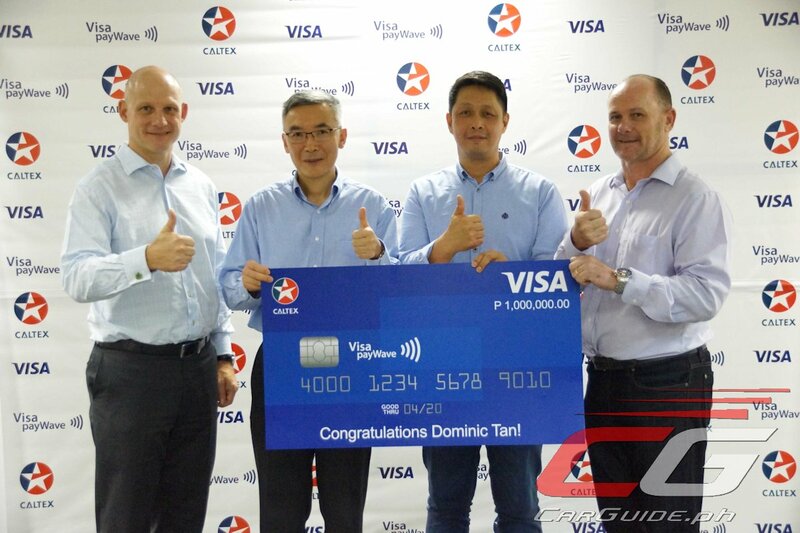 Caltex has improved payment facilities in participating stations through the Visa payWave technology to enhance Filipino motorists’ gas-up experience. Visa’s newest card feature allows cardholders to pay for Caltex fuels more conveniently by waving Visa payWave-enabled cards on contactless terminals. Aside from the grand prize winner, Caltex also gave away P 100,000 worth of StarCash to three lucky winners each. “Partnering with Visa for the payWave contactless technology has allowed us to enrich our loyal customers’ fueling experience with value-added services,” said General Manager, Philippine Products, and incoming CPI Country Chairman Louie Zhang. “We are pleased to partner with Caltex to reward Visa cardholders when they use Visa payWave to pay for their fuel purchases. Congratulations to all our winners, including Mr. Dominic Tan, who walks away with the grand prize of one million pesos. We remain committed to bringing more relevant rewards for our valued cardholders and hope that more Filipinos get to experience the benefits of using contactless payments in the Philippines,” said Stuart Tomlinson, Visa Country Manager for the Philippines and Guam. Customers may get in touch with their local banks to inquire about Visa payWave.